If you wonder why Marion Cotillard has risen to fame so meteorically, going from a no-name to marquis name in two short years, look no further than the “F.I.L.M. 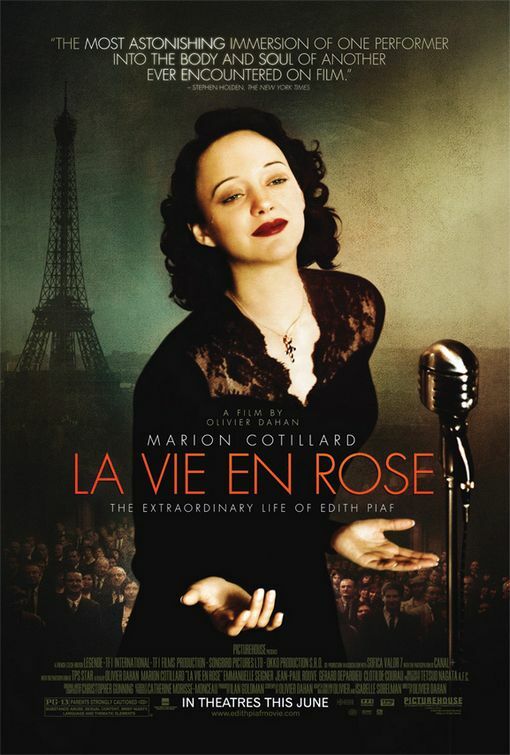 of the Week,” “La Vie en Rose.” Cotillard envelops herself in the persona of Edith Piaf, France’s greatest popular singer, and the Academy wisely took notice and bestowed the Best Actress statue on her in 2007. Even if the movie isn’t your cup of tea, the performance will absolutely floor you. She engrosses herself in Piaf from head to toe; every movement radiates her complete confidence and comfort in the role. The film chronicles the life of Piaf from her deplorable days on the streets of France up to her last breaths and all the breathtaking highs and tragic lows that occur between. It presents the events as a broken narrative, mainly presenting the events as memories from an older Piaf. However, there are three distinct timelines running through “La Vie En Rose.” The first follows Piaf from her days being fostered by a caring prostitute at a brothel near the end of the Great War to her final performance, the second from the beginnings of her morphine addiction to the collapse of her health, the third from her days feebly eking out the energy to live to her death. The timelines often overlapped, resulting in some sequential confusion, but Cotillard wows with such finesse that the missteps can be easily overlooked. A decision I found interesting in the film was the omission of subtitles during Piaf’s songs. But if you don’t realize it before the thrilling climax, Cotillard’s acting tells you everything you need to know. Her eyes, her face, her hands, and her body get the feeling across perfectly. And in the film’s final scene, when she sings “Non, je ne regrette rien” in a decrepit state, you feel every emotion in those two minutes that you have felt throughout the whole movie. All the happiness, fame, sadness, and tragedy of Piaf’s life pours out poignantly because Cotillard makes them palpable. I later learned that the title literally means, “No, I Have No Regrets,” and the lyrics express overcoming the grief and sorrow and turning it into strength. The song is a compelling and prodigiously moving way to cap off a ravishing performance by Cotillard. This is easily the best female performance of this decade, and it will undeniably remembered for decades to come as a mammoth achievement of acting.